About three years ago, I outlined China’s plan to extend its infrastructure growth without creating more white elephant projects in China (see China’s cunning plan to revive growth). Enter the One Belt, One Road (OBOR) initiative to create infrastructure projects in the region. OBOR projects were to financed by the Asia Infrastructure Investment Bank (AIIB), which many countries had been falling all over themselves to finance. The infrastructure projects were to be led by (surprise) Chinese companies, which would extend their flagging growth. openly rejects the BRI, saying China’s projects with neighboring Pakistan infringe on its sovereignty. None of these problems are big surprises. I had outlined in my 2015 post that Chinese led infrastructure projects tended to see inflated costs, and the geopolitical objective of OBOR was to extend China’s influence in the region. Today, China faces two separate problems. The most immediate issue are rising trade tensions with the United States. The second and more pervasive issue is the growing mountain of debt, which are backed by less productive assets, which elevates financial tail-risk. 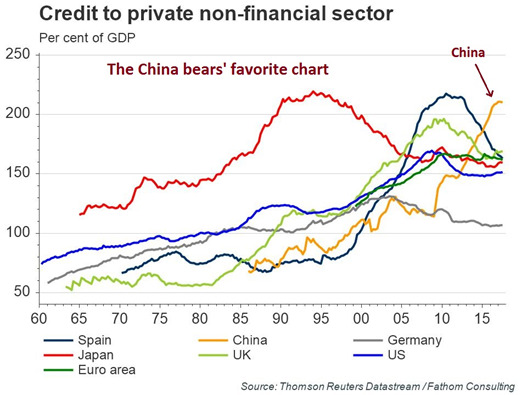 The China bears’ favorite chart exemplifies that problem. The latest developments indicate that Beijing has developed a cunning plan to defuse both trend tensions and reduce financial tail-risk. China’s current account surplus with the United States is a sore point with Donald Trump, but trade imbalances are in the eyes of the beholder. This analysis from Nomura indicates that China’s current account surplus would be greatly reduced if Hong Kong fund flows were to be included. Other analysts have pointed out that the advent of global supply chains overstate China’s trade surplus. For example, if Apple were to import an iPhone manufactured in China with a stated value of $1,000, many of the iPhone components are manufactured elsewhere, and so is the intellectual property value of the $1,000 phone. If you were to only include China`s value-added to the $1,000 iPhone, it would fall substantially. These proposals are nothing new, and general big picture statements are short on specifics. It remains to be seen whether these proposals will act to reduce trade tensions. But wait! Did Xi say he would open financial services to foreign investment? One of the biggest problems faced by the China is the resolution of the growing debt bubble. Even though most of the debt is denominated in RMB, and popping the bubble will not result in a typical emerging market debt crisis where most of the debt is denominated in USD while a country’s currency tanks, resolving a future debt crisis will not be without costs. In all likelihood, Bejing will opt to socialize the debt, and the price of debt socialization will likely be a prolonged period of slow growth. Enter “foreign investment in financial services”. If the foreign devils could be convinced to enter the Chinese market and lend in RMB, China will have managed to externalize financial tail-risk. The PBoC won’t have to socialize the cost, it will be the foreigners. Oh, please! Don’t throw me in the briar patch! Chinese onshore bonds are becoming a larger part of global investors’ portfolios, suggesting their gradual acceptance as mainstream fixed income investment ahead of their anticipated official inclusion into one of the most followed international benchmark bond indexes. Foreign investors’ participation in yuan-denominated Chinese onshore bonds rose to 1.09 trillion yuan (US$172.9 billion) in March, up from 1.07 trillion yuan in February and from 761.6 billion yuan in March 2017, according to data from China Central Depository & Clearing. The increase in foreigners’ holdings however is from a low base – foreign ownership remains only about 2 per cent of China’s US$12 trillion bond market. The initiative to open Chinese domestic capital markets even got Ray Dalio all excited (see Bloomberg interview). Both Dalio and the Chinese leadership are known to have long time horizons and play the long game. Who is right? Who has the cunning plan?